John E. Brady, Maribeth Graham, Jeffrey C. Wolf and Richard Kent Green in Chatting with the Tea Party. Photo by Matthew Duncan. 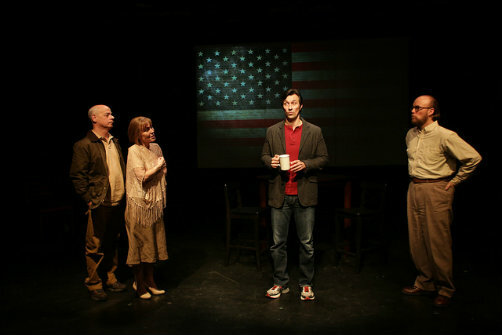 BOTTOM LINE: A documentary-style play that sets out to humanize the people behind the Tea Party. When a new play opens in New York that references the Tea Party in the very title, I expect childish, unapologetic, conservative-bashing buffoonery. I am happy to report that is not at all what Rich Orloff’s documentary-style play turned out to be. Instead, Orloff offers a thoughtful and earnest exploration of the opinions of Tea Party members and “the beliefs that create the soil in which [their] opinions grow,” as he so eloquently puts it. The play is based on more than 63 hours of interviews that Orloff conducted with various leaders of over 20 Tea Party groups around the country. The interviews are performed verbatim here by an excellent four-person ensemble led by Jeffrey C. Wolf who plays a playwright named Rich, presumably modeled after Orloff himself. The other three actors, John E. Brady, Maribeth Graham, and Richard Kent Green, play both the Tea Party members and Rich’s liberal friends. It was refreshing to see the Tea Party members played sincerely and with no hint of judgment or mockery. Orloff and the ensemble make an honest effort to represent them with an open mind and without parody. They exercise less sensitivity and caution when portraying Orloff’s liberal friends, people whose views, I can only imagine, are probably closer to their own. The play, directed by Lynnette Barkley, is a sincere attempt by the playwright to understand, not condemn, people whose opinions differ from his own. The sweeping conclusion is that Tea Party members are just people too. While I appreciate this ostensibly open-minded sentiment, I find it a bit simplistic. If that’s the great recognition then the assumption that kicked-off this exploration is necessarily a little less flattering. Marketing materials claim that the play “is neither anti-Tea Party nor pro-Tea Party.” However, Orloff’s impulse is to humanize those that he is otherwise inclined to demonize. That very inclination is inherently anti-Tea Party. What we have here is an anthropological project designed to help us understand and empathize with people that, on first glance, we might find abhorrent. Chatting with the Tea Party is by Rich Orloff, based on over 63 hours of interviews with members of the Tea Party. Directed by Lynnette Barkley. Set and Lighting Design is by Nick Francone. Costume Design is by Orli Nativ. Production Design is by Paul Girolamo. Sound Design is by Daniela Hart. Stage Manager is Jenny Ainsworth. The cast is John E. Brady, Maribeth Graham, Jeffrey C. Wolf and Richard Kent Green.